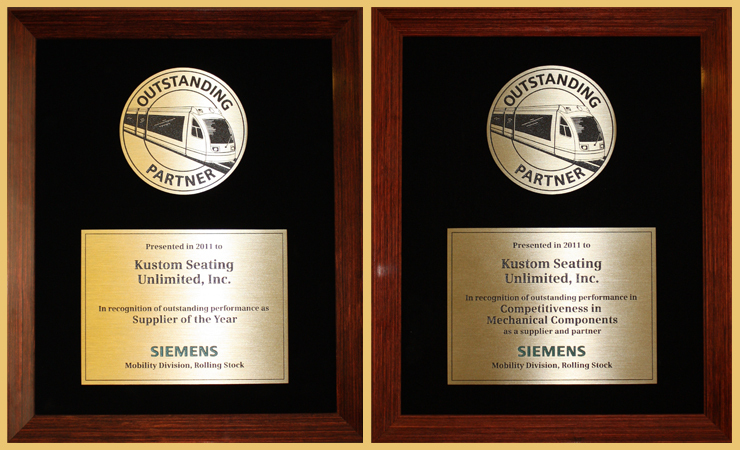 Making Tracks - Kustom Seating Unlimited, Inc.
KSU Awarded "SIEMENS' 2011 Supplier-of-the-Year" & New Association with Vergara Studio, LLC. KSU has been a business partner of Siemens since 2005. Siemens Mobility Division is globally recognized as an original equipment manufacturer (OEM) of passenger rail cars. Kustom Seating Unlimited, Inc., of Bellwood, IL, (ISO 9001:2008 certified) the North American leader in rail transportation seating products is pleased to announce that it has engaged the services of Vergara Studio LLC (VSL), the internationally recognized industrial design firm for the Rail Industry. KSU supplies custom engineered seating solutions for all major OEM’s and transit authorities and has been recognized as the 2011 Supplier of the year by a major OEM. KSU was the first seating supplier to have products in service that adhered to the latest American Public Transportation Association’s (APTA) Rev. 2 standard for safety and crash worthiness. Integrating KSU’s influences in seating safety, expertise in design, and excellence in manufacturing rail seating with VSL’s signature designs, will define the industry with advanced and innovative seating solutions. Cesar Vergara, principal at VSL, has served as the National Principal Design at Jacobs Engineering Group, Chief Designer of both Amtrak, and New Jersey Transit and Senior Director of Rail Transportation at Teague. Cesar brings a global view and wide range of expertise and design influences to VSL. As a winner of a Presidential Design Award, Cesar’s work has earned AMTRAK five Brunel awards for excellence in public transportation. His work was featured at the Art Institute of Chicago in their exhibit “Splendid Trains and Stations” as well as the Smithsonian Institution’s National Design Museum in NYC Triennial. As a very active contributor in the High-speed rail community, Cesar is a frequent speaker in APTA, UIC and other trade association conferences. ©2011 KUSTOM SEATING UNLIMITED, INC.